“There had been no official declaration of a universal truce. In fact, commanders had gone out of their way to forbid any stopping of the fighting. And yet more such truces–hundreds of them–were arranged that Christmas morning all along the Western Front. Some truces were arranged by posting a sign suggesting a cease-fire. Others came about through shouted negotiations between lines or simply because soldiers wandered into No Man’s Land and weren’t shot. “These truces were arranged so quickly that high-ranking officers could do little to prevent them. Lieutenant Colonel Charles McLean was making his daily tour of the trenches when he spotted some of his men clambering over the top and wandering toward the enemy. He ran along the trenches, shouting for his men to return, but they ignored his instructions” (69). 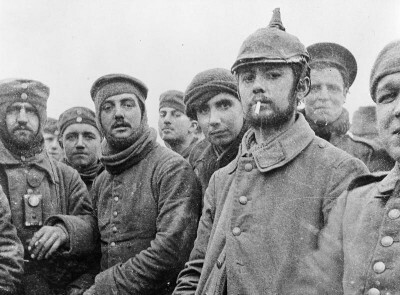 British and German soldiers fraternizing at Ploegsteert, Belgium, on Christmas Day 1914. “The soldiers mingled in the blasted area between the lines. Small gifts were presented to the enemy, such as jam, cigars, cigarettes, chocolate, coffee, sausages, nuts, tea, and newspapers. Many soldiers exchanged souvenirs, including regimental badges and buttons cut off their uniforms. One of the most highly prized items was a Pickelhaube, the spiked helmet that was still in use by the German army early in the war…. “Many strange and unusual things were observed that day. Bruce Bairnsfather was amazed when he saw ‘one of my machine-gunners…cutting the unnaturally long hair of a docile Boche, who was patiently kneeling on the ground whilst the automatic clippers crept up his neck'” (76). I first learned about the Christmas Truce from an animated TV program that used to air on PBS every December. Simple Gifts included six stories about Christmas. My favorite of these was always “December 25, 1914,” which is based on a letter from the Western Front by British Army Captain Sir Edward Hulse. Unfortunately, as far as I know, Simple Gifts is no longer aired and is not available commercially. But all of the segments are available on YouTube. Watching “December 25, 1914” at this time of year has become one of our family traditions. “The idea of a truce during war wasn’t new or unusual…. During the American Civil War, numerous truces were arranged to bury the dead and to remove the wounded from the battlefields. Most such truces were approved by the officers for a limited amount of time and for very specific reasons. The Christmas Truce of 1914, however, was unique. While some senior officers went out of their way to ‘look the other way,’ most officers worked hard to put an end to it. The fact that the men under them defied these orders is extremely unusual. In addition, the truce lasted much longer and involved many more soldiers than any other previous truce” (69-72). “The more friendly contact [the soldiers] had with the enemy, the less anger they felt toward them. After describing in detail how neighborly the enemy across from him was, German captain Rudolf Binding concluded his diary entry with, ‘Truly, there is no longer any sense in this business'” (50-51). “[General] Smith-Dorrien fired off an angry message to his commanders: ‘I have issued the strictest orders that on no account is [fraternization] to be allowed between the opposing troops. To finish this war quickly, we must keep up the fighting spirit and do all we can to discourage friendly [meetings]'” (82). Another excellent work about the truce is folksinger John McCutcheon’s ballad “Christmas in the Trenches,” which tells the story through the eyes of Francis Tolliver, a fictional British soldier. Several different performances of this song are available on YouTube. This one includes an introduction in which McCutcheon describes meeting German WWI veterans who participated in the Christmas Truce. “In another section, the order to fire on the British nearly caused a mutiny. ‘When the order to fire was given,’ a German officer told Ethel Cooper years later, ‘the men struck…. The officers… stormed up and down, and got, as the only result, the answer, ‘We can’t–they are good fellows, and we can’t.’ Finally, the officers threatened the men with, ‘Fire, or we do — and not at the enemy!’… We spent that day and the next wasting ammunition in trying to shoot the stars down from the sky'” (86-87). “A genuine friendship developed between the English and German soldiers in Ploegsteert Wood. Because an inspection by a high-ranking officer meant the men would have to demonstrate a fighting spirit by firing at the enemy, both sides took to informing the other of such visits. Lieutenant J. D. Wyatt recalled the day when ‘a message came down the line to say that the Germans [expected] that their General was coming along in the afternoon, so we had better keep down, as they might have to do a little shooting to make things look right!! And this is war!” (89). Major Murdoch McKenzie Wood: “‘If we had been left to ourselves there would never have been another shot fired. For a fortnight that truce went on. We were on the most friendly terms, and it was only the fact that we were being controlled by others that made it necessary for us to start trying to shoot one another again'” (98). Ministry of Information, First World War Official Collection, Imperial War Museum, Catalog # Q11745. © IWM (Q 11745). Used with permission under IWM Non-Commercial License policy. Beyond "I have a dream"